Please note that this current website does not have a shopping cart. To buy our Mohawk Breastplate Chokers online, please go to our e-commerce website at NaturalExotics.ca. 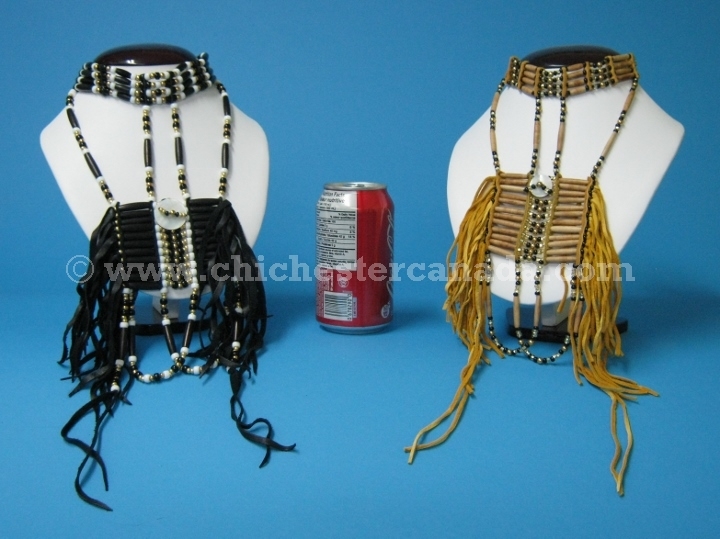 A Mohawk artist on the Kahnawake Mohawk Reservation south of Montreal makes these exquisite breastplate chokers using the ultra-thin hairpipe we manufacture in Vietnam. Each piece has a clam shell button in the middle, glass beads, and deerskin trim. They come in a variety of colours. Please see our gallery for chokers available for sale. Genus and species (clam shell buttons): Hyriopsis schlegeli. Wild. Deer and Clams are not endangered and are not subject to CITES controls.